« Embryological basis of WPW syndrome : AV node complexeties unraveled from Amsterdam ! A strong willed person rarely develop syncope. We know weak hearted (Or is it weak brained ?) men and women may faint when the emotions swing unexpectedly .The commonest cause of syncope is neuro-cardiogenic syncope (NCS) . (Formerly called as vaso-vagal syncope VVS ). Few facts need to be emphasized here . There are many critical circuits and components to common syncope. Prompt recovery after the fall. Trigger can be emotional or mechanical (Prolonged standing , dehydration , etc ) . It occurs generally in an emotionally charged environment with a high basal sympathetic tone . The center is in the medulla . Both vagal and sympathetic centers are involved with potential spill over on either side. If stress increases the blood pressure , absence of stress will have to lower the blood pressure . If anxiety cause hypertension , depression is expected to cause hypo-tension. There are strong reasons to believe common syncope (NCS) is primarily related to the state of mind and the neural regulation. Dizziness , giddiness near syncope are closely related to psycho-somatic disorders. Strong willed men and women rarely develop syncope.Their vascular tone is well in control even in critical times .This fact has been well observed in the setting of traumatic and hemorrhagic shock in critical care units , where some hold their blood pressure well even in adverse circumstances and few sink without any fight . Is psychogenic , situational , pain syncope same as NCS ? Technically it may not be same. But all of them share at least 50 % 0f the circuits of NCS. .However there is no consensus to call psychogenic and pain syncope as types of NCS. While in the classical NCS heart has a central role in generating hyper active sympathetic afferent from myocardial stretch receptors. In psychogenic and pain syncope cardiac stretch receptors are not much stimulated instead , the spillover occur directly from sympathetic to parasympathetic nucleus in medulla. In pain induced syncope parasympathetic limb gets vigorously stimulated in isolation to cause a severe vaso-dilatation . But once the syncope sets in we often observe bradycardia and cardiac limb may get activated as well. * Presence or absence of cardiac limb in NCS and NS is critical with reference to efficacy of beta blockers in NCS. The current guideline of NCS management( ESC 2010) is strongly biased against beta blocker (Class 3 -level A) which we feel is incorrect . Bulk of the patients with NCS respond well to long term beta blockers . Please realise , beta blocker is the only drug which can break the NCS circuit at multiple levels . (Sympathetic trigger, sympathetic afferent, cardiac stretch ! 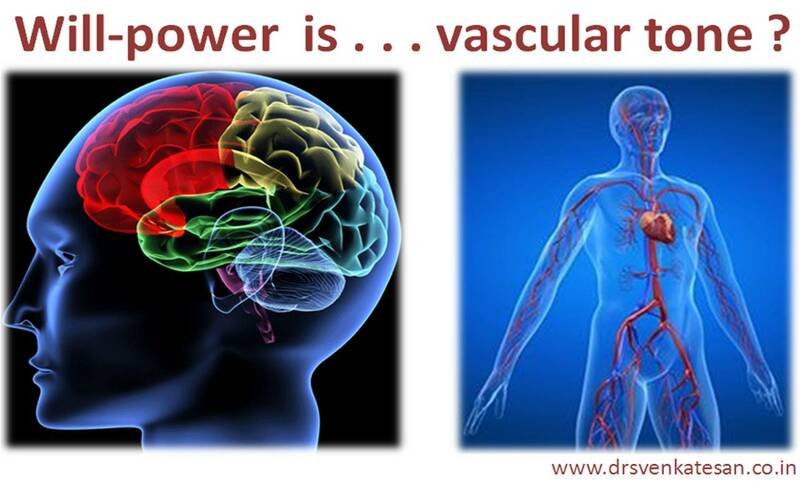 It doesn’t require great brains to realise vascular and neural system are intimately linked . We know today, NCS is primarily a neural phenomenon hence the mental status has a dominant control over the vascular system especially at times of stress . Clarity is still elusive in defining the trigger and afferent limb for the NCS , fortunately the final common efferent pathway that makes the patient fall is indisputably vagal ! . Medullary vagal nucleus though fires independently , also gets powerful central parasympathetic flow from cortical areas . Paradoxically , controlling sympathetic outflow (Anxiety ) is often an easier way to reduce parasympathetic flow. This is referred to as competitive , accentuated antagonism. One can prevent recurrent syncope by vigorous mind control at times of extreme stress. This is confirmed indirectly , by the fact reassurance is the key to successful management in vast majority of patients with NCS .We learnt this simple fact after trying exotic methods like DDDR pacing and so on . Power of the mind can never be under estimated even in cardio- vascular hemodynamics . When pathologically high, it can spike the blood pressure and break few vessels in brain , while if it is inappropriately low , may induce a syncope or result in persistent hypo-tension . Let us learn to use our mind over body properly .Yogis do it style and live for 100 years ! Iam surprised why this post has been looked so negative by the readees. Almost all rated it as very poor. Iam still pondering over it. Realised to lable patients as weak minded could be one of the reasons. I think what I wanted to convey was there is link between mind and vascular system. Please let me what is seen as offensive, let me learn and correct in future.